Jinchu was walking, almost aimlessly in the busiest area of downtown, the middle of Falcon City. There was little wind around, just enough to lightly tug the trailing backs of his red coat and the ends of his fiery hair but not much more. People moved and bustled past him, most likely trying to get the complete opposite sides of town, most probably going to see the guild that takes up residence in this town, Sable Pantera. He heard shouts from people a bit behind him and was faintly amused, 'I wonder what has gotten them all riled up?' He almost let his curiosity convince him to go and check it out but something told him it would be better if he ignored it. It sounded less like trouble than just some kid playing a prank on some unsuspecting tourists or older people, nothing that he should interfere with. His walk still seemed to give way to no specific direction until something caught his nose. An intoxicating smell of hot food. In response his stomach made a low growl, barely audible but it would do the trick to get Jin's attention. "Damn, I swear I ate breakfast, what's with me?" Even though confused he could not ignore his body's call, "I guess I'll grab something, might as well be heavy too so I actually fill up." He followed the smell that got his stomach going, with every intention to eat the shop out of business once he found it. As he got closer he gradually sped up, joining in the bustling nonsense. It got to the point where he was almost close enough to taste it and in response Jin was ready to run full-tilt to his destination. The only thing that kept him was the fact that he accidentally bumped into someone, quite forcefully even, nearly knocking them right off their feet. "OOPS! Sorry, sorry! My fault, are you OKAY!?" No one was taken aback by her personality anymore, not the regulars of Falcon City at least. They now recognize her even from a far distance away: her springing steps, her nearly excessive volume, and the way her clothes seem to just cover everything from her neck to her ankles. A long sleeved turtle neck sweater the shade of ivory white, a long pleated dress smothered in a darker shade of violet, skin stockings, and navy blue dark heel boots. Elegant in description, but entirely plain and ragged up close; a fair price to pay considering their less than quality material. The only redeeming item on Sofia’s person being a larger than normal basket, weaved to flawlessness and seemed capable of fitting and carrying fresh fruits and vegetables. Swinging it around in her left arm dangerously, a person could be easily perturbed if they weren’t used to such a sight. The huge amount of space required for her overreaching movements seemed to pass easily through the spaces of the crowd as they seemed to add more and more bodies the further she travelled against the moving tide. Some she has seen before, others were strangers. To those who have met her, they would’ve taken note of her long and curly modestly violet hair and corresponding eyes. They knew it was Sofia, but her appearance made her seem a whole different person. Dodging the crowd skillfully, without any effort on her part, Sofia took this opportunity to leave the security of Sable Pantera and indulge in one of her favorite pastimes. Justifying like always, whispering loudly, ”I can’t get everything Sable Pantera needs if I’m hungry,” or even, , ”I’m sure they wouldn’t mind if I eat food out here instead of at the guild…” Sofia’s mind was made up long before she even reached the display window. The smell of a roasting duck permeated the air, being covered in various unnecessary herbs to accentuate its aroma; and then there were the baked goods just right beside it. Jumping up and down in joy, Sofia quickly turned and apologized profusely, ”Sorry sorry sorry, I think I saw you and I didn’t move!” Only for her to realize she was saying those words to empty space. Looking left and right, Sofia adjusted and turned to the one she assumed bumped into her: a young man with a passionate color for hair, ”I’m sorry, I’m sorry! Umm…can I keep apologizing to you in there?” Sofia asked him, pointing to the source of the aroma she so desperately clung to. The girl Jin ran into fell flat on her face, her smaller frame only made him feel worse, his weak apology was hardly a remedy for what happened either. He was about to vocally address his apology once more but Jinchu caught that the girl in question was barely even taking notice of him, grabbing at the basket she dropped and furiously examined it before even making a sound. ”Yes yes yes, IT’S NOT BROKEN!” She picked herself up and actually jumped for joy, the basket must be important to her in some way but for the moment her reasons for celebration would be a mystery to Jin. She apologized, giving an explanation that left her at fault for the collision but Jin knew deep down that he was the cause of their abrupt and unexpected meeting. Jin shook his head lightly but did not speak as the girl continued on. ”I’m sorry, I’m sorry! Umm…can I keep apologizing to you in there?” She pointed to the route of the cause, the haunting aroma of hot food that once again would send Jin's stomach into a starving fit. "Don't apologize, It was my fault, are you hurt?" his stomach lowly growled, barely audible enough for an ear to catch, "But yeah I would like to go in there... Are you hungry? I could buy you lunch, the least I can do." Jin was usually a little less serious and concerned in a social setting but he felt quite guilty for knocking the girl over. The way she so innocently dressed, barely showing a sliver of skin, didn't help either; it made him feel as if he trampled a very young girl, a child even. He swept his hand out slowly, gesturing her to take the first step, "What's your name by the way? I am Jinchu." It was slightly off, assuming a gentleman's role for the sake of the girl but it was the least he could do, little did she know that if Jin's magic wasn't suppressed as harshly she would have had a lot more to worry about than a broken basket. A gentle smile took shape on his face and his voice came to life once more before she could protest, "Just let me make it up to you." His words were laced with genuine feeling, almost hypnotic but taking form in a fresh, pleasing manner. Fidgeting endlessly, hoping he would say just one word she wanted him to say, yes yes, into the land of paradise we go, Sofia gleamed straight at him like a small animal hoping for some sort of affectionate pat on the head and inevitable first meal of the morning. Aggressively shaking her head, Sofia responded with an overtly positive disposition contrary to the answer she gave, ”No no no, I’m used to getting knocked down!” Bursting out with laughter, one would swear her mind was completely out of it, if not for her obviously forced laugh being used to suppress and hide her own sounds of a stomach shrieking in protest at its empty contents. Almost whining, nearly traveling to the pleading zone, Sofia was caught off guard a simple request she just couldn’t possibly refuse. All Sofia could do was falter and agree to such a request despite her spirited efforts, lamenting internally that they had all been for naught. Jinchu took notice that this girl was behaving in a rather interesting way. It was peculiar how she danced from one thing to the next in abrupt bursts, reminding him of a personality of a young girl that still held on tight to their stuffed animal for comfort, 'Haha, she is cute in her own little way, I can already see an interesting afternoon ahead of me.' The only thing that he was momentarily confused about is when she referred to herself as "us" like there were others with her. Deciding not to dwell he shrugged it off as nothing important and moved on. Alright, nice to meet you Sofia. By the way you don't need to call me Mister; just Jinchu is fine. He had barely finished his sentence before the girl was off into the harbinger of cooked food, nearly crashing the basket once more into Jin. He made an open-mouthed smile as Sofia spun just quick enough to avoid hitting him though. Jinchu immediately followed, much too hungry to just casually saunter along into the restaurant. Sofi's eyes looked as if they were watching every bit of cooking food with a longing, she basically just exemplified hoe Jin's stomach felt on the inside. ”How much can you afford Mister Jinchu?” She called him 'Mister' again. He wasn't offended though so Jin made no attempts to correct her, given the fact that she might not have even heard him say he was comfortable with just being called Jinchu. "Uhmmm... How about you just get what you want and I'll pick up the bill. I just finished a request so I got jewels to spare, haha!" Snapped back to full attention and a loud sense of happiness upon seeing a drop of melting flavor continually drip of a pig’s haunches, Sofia’s jaw unhinged enough to reveal a sense of longing and desire for something so close yet so far. If he truly planned on treating her, Sofia fully planned on taking advantage of this rare opportunity. Jinchu merely looked at Sofia, blank-faced, as she blatantly admitted she called him mister because she didn't know his age and her guild has an overactive manners policy. 'Uh... That sounds dumb...' He did not voice his views out-loud as it really wouldn't change anything besides make the situation a little awkward. ”I’m 16 Mister Jinchu, and I want that one~,” He looked, seeing the haunches and his own mouth nearly started to drip. Jin didn't say anything though, as Sofia was continuing, striding along the area in her dainty and dreamy way, picking out this and that as more to eat. Jin followed her, walking normally but he did catch as the guy at the counter watched everything she was doing. It was almost as if he was caught in her trance of spins and twirls, guided by her voice. She had finished her list, abruptly turning to meet Jin's eyes. Sofia twitched all around, a fidgety person like none he had ever encountered before. Her gaze held, staring into his soft, gentle, aqua-green eyes for a moment longer than expected. Most people would find it quite uncomfortable but he found it almost intriguing, trying to understand what she was all about just for a moment. Jin broke the lock of their eyes finally, looking off into the distance, almost looking solemn but in honesty he was just spacing out for a second. ”Because if you do, I'm going to order more.” He was brought back down to earth just enough t hear her last sentence. It seemed this girl was not shy to optimize on a free meal. Jin raised his eyebrows at her, corner of his mouth slightly giving way to a smirk and he turned around, walking away. It didn't take long to see that he was walking to the counter. Jinchu leaned forward, resting his forearms on it as he spoke to the man on the other side. "Alright, you see that girl over there?" he turned to point at Sofia and returned his gaze to the man. "I want two of everything she ordered. And I know I don't have to say it all to you 'cause you were watchin' her like a hawk." The man turned, ready to go gather it all before Jin placed a hand on his shoulder to stop him, an innocent smile beaming on his face, "Oh, and about the cookies, could you just bring a platter out? Haha!" With that he turned once more to face Sofia, "By the way, I'm seventeen! We're practically the same age." That kind smile still shone through, really bringing out the sincerity of his gentle side at the moment. He’s so nice, Sofia thought to herself, nice enough to spend all his jewels on just one meal for him and her. She thought how terrible it must be for him to watch her want this and that and everything, picking out choice cuts as if she hadn’t eaten in days; but these thoughts immediately shifted to that of guiltless, and somewhat mischievous intent when Sofia noticed his own greed begin to show. Her eyes lit up quietly, without any trace of interest visibly seen in any part of them. Rather than calling attention to it immediately, Sofia kept it to herself, intent on enjoying herself and taking advantage of his kindness for just a bit longer. Out of curiosity, Sofia’s eyes stayed fixed on Jinchu’s own; she would not let him see who she is, unfurling the curtains before he can even peer deeply into the window of her soul. But Jinchu, she would cheat and see what he wouldn’t want her to. Locking her fidgeting movements still in one swoop, Sofia’s gaze tried to reach deep within Jinchu’s eyes, to find that which interested her; but just as soon as she began to rifle through his eyes, he turned away with such intensity that her eyes followed him and nearly disappeared into the darkness of her socket. Without thinking, Sofia released a slight yelp; too slow for her to take it back, but too quick for him to make too much note of it. Recovering almost as fast as she had slipped, Sofia slid just behind Jinchu, giving him the lead while she took the time to realign her mind after her slight fiasco. To her detriment, like him, Sofia’s mouth screamed for her to simply dive in and eat everything on sight, but a small part of her mind commanded her to not make a scene. Voicing a single convincing word of confusion, ”Jinchu?” Sofia, taking this opportunity to thoroughly analyze him, looked at him with a single perky tone in every single muscle in her still body. ”17? That means you’re a year older than me, but you’re spending so much money on me even though it’s hard to make this much for people our age,” there was barely any change in inflection in her voice, Sofia continued giving light to a slight coy smile in the corner of her mouth, ”Jinchu, are you trying to get me to spend time with you by being so nice?” Jinchu broke out of his smile for a moment, eyes wide and a little confused at her question, 'Wait, what does she mean? I like making friends, maybe she's hinting at that, haha.' The smile returned to his eyes but there was little expression in, as if contemplating what to say next. "Sure, I guess you could say that. I love making new friends!" Jin spoke the words of a fool. Even though it was clear Sofi had entertained the suggestion that he may be expressing a bit of an interest in her more-so because he could be attracted to her, a thought like that hadn't quite crossed his mind. When it came to girls Jinchu was a rather oblivious guy, he didn't pick up on those type of cues unless they may be concerning someone else and even if they were even too blunt for him to ignore he wouldn't know what to do about it. "Great." Jin quickly turned back around to many trays of food being laid out before him. Others almost looked shocked and others quite concerned about the amount. The young mage on the other hand didn't think much of it and began grabbing trays to bring them to a table he chose out of the blue, smack in the middle of the place. He didn't ask for Sofia to help him as he was paying for the food, meaning he was treating her for the moment and that let the whole thing fall on his shoulders to take care of. Just as he grabbed the last tray and passed the girl, fidgeting like always, he let some words slip to welcome her to join him, "C'mon sit down, don't let the food get cold." The entire table was hidden by their spoils with the cookie platter placed in the center. There were four chairs, one on each side of the table, Jinchu picked the seat that had his back facing the counter as he would feel weird to look back at that guy while trying to enjoy his meal. Jinchu never specified a seat for Sofia to sit in so he figured she would just choose where she felt most comfortable. As soon as she sat he was going to dig in. D-did she get it wrong? She couldn’t have, Sofia was at least just a little sure that would unnerve him at least a little bit. Puffing her cheeks, Sofia responded with a mild sense of displeasure, ”Yeah yes yes. I like making friends too Jinny…” What a pity, Sofia tried to play a little game with Jinchu and he somehow turned it into mere small talk. Granted, the game would’ve only been enjoyable to her, but the manner in which he deflected it with but a single sentence, an honest one in fact, pulled at the very corners of her own pride and desires. Attempting another ploy, Sofia slid quietly next to Jinchu, uncomfortably close, and asked him, ”Have you ever made a friend who stands to you really close, like this?” Sofia’s ears peered straight at him, her height forcing her face to tilt upwards while her hands wrapped around each other as if they were restraining themselves. Impatient, distrusting, Sofia followed Jinchu liked a wolf following its prey from behind, only she disregarded such notions of personal space. Where he walked, she stayed directly behind him; where he sat, Sofia sat right next to him as if to tell him with one piercing glance, I won’t let you eat everything by yourself! Without even responding to Jinchu, having anticipated he would begin his own massacre as soon as she sat down, Sofia’s fidgety hands and twitching toes turned rabid almost as fast as her body was set perpendicular to the floor. Grabbing this, attacking this, subduing this, it appeared a war zone with Sofia’s aggressive movements. One hand would hold down one piece while her other hand swooped in from behind and tore it apart. And like prisoners of war, she treated them all kindly; cherishing them, loving them, respecting them…at first, before sentencing them to a fate fitting for prisoners of a fallen army. "Umm, alright." Jin wasn't so particular about eating that the thought of taking some of Sofia's share even came to mind. Either way he just shrugged, raising his eyebrows as the girl sat right next to him. He waited only for his rear to touch her seat before he started, finally beginning meal. Much to Jinchu's surprise, Sofia was a barbaric eater. She was too busy making her own onslaught to even notice that Jinchu was keeping pace with her while being perplexed by her ferocity. He was a scary-fast eater, able to put away course by course within minutes so it was literally just in his own amusement to match the tiny beast that sat next to him, enjoying her spoils in the most ridiculous of fashions. "Well, I work a lot, and I'm good at my job, haha!" Jinchu took a bit of meat the size of a fist with his fork, downing it similar to the action of taking a drink. "And no problem, by the way, it's not like I wasn't hungry too." With that he began to laugh, swiping a cookie quite quickly. It was really a site to see how much he was enjoying his time with this eccentric stranger he just accidentally bumped into on the street. --To others, Sofia seemed to turn from a glutton to a mass murderer of food; but to Jin, especially, Sofia would have just been highly enthusiastic, if only because of their sitting position. Somehow, in between bites, Sofia managed to ask, ”wha---douyou-----do?” He works a lot, but he never answered what he does. She will be answered, no matter what it takes! Jinchu was taking care f his own devices for the moment, giving a little more time to get some good tastes of his food before allowing it to disappear and hide away in his stomach. He was eating quite fast though, a slow meal for him was as fast as a winner at a food-eating contest. He did little to notice Sofia's questioning of his line of work, didn't even realize at first that he was ignoring her. "U-um... Well to answer your first question I am a mage, I gain money by doing lots of requests, haha! I usually go for the ones that ask for a lot more combat related detail, so I usually get higher paying jobs that way." And with that he just looked at her, raising his left eyebrow to show his interest almost in a comedic way. "And why am I not disgusted? Well.... It's not like It's my job to worry about how you eat. I assume you will do what you want and I can live with that, ha. Would you rather I cared a lot and decided to complain? Because I think that only makes it harder to be friends if we're at a disagreement on the first day." Jinchu dropped his brow back to normal and let his smile grow slightly, letting his natural confidence leak into his gaze. He did not know it but he was a rather hansom young man. His youthful features were like a child's but was his developed jaw-line and presence that gave hint to his real age. His emerald eyes would keep looking into Sofia's, possibly to be perceived as flirting but it was not his intention. He was most interested in what the interesting girl was going to say next. ”Ah?” Just like that, her barbarism…stopped. There was evidence of a slaughter on her silverware, signs of mercy being cast aside, but it was as if the perpetrator disappeared off the face of the world completely. ”Mage…” Sofia whispered with the air of impending doom grabbing tightly onto her shoulders and tightening them in a secure, yet uncomfortable, aversion to Jinchu. He’s a mage. She wouldn’t have any problem with that if she really were just a servant girl, but he’s a mage. Sofia promised Pikels she would always be careful around others, but she let her guard down and let someone treat her to this massive meal. He’s a mage. He’s nice and all, and Sofia is truly grateful. But, he’s a mage. Sofia played these thoughts over and over again, trying to find a reason to not be stiff and frightened around him. But, he’s a mage. These people are all different, all dangerous. They all want the same thing yet only one can have it. They’ll do anything, even dispose of another. Another like Sofia. ”He’s a mage,” Sofia repeated softly, her appetite full from this unfortunate realization. Admittedly, she tried to play games with him, make him feel uncomfortable; but what else is she supposed to do without Pikels by her side? But his gaze, his gaze, his declaration that he wanted to be friends struck a chord in her nerves and caused her tongue to stiffen immensely. Trying to find someone to clear her uncomfortable air, she expelled it, one word at a time, ”Thank you.” Picking at her food unenthusiastically, Sofia’s volume grew quieter and quieter, ”My best friend always tells me I need to eat and grow stronger, but he always leaves when I start…” She misses him. Her voice made it seem like she was saddened at his abandonment, but she truly misses him. He is the only one who truly cares for her. ”…” Flaky twiddled everything she could, fingers, toes, nose, noses, ”…” her eyes flew back and forth, trying to avoid Jin’s genuine desire to be friends. ”I…” Sofia hesitated, her body wanting to race out of the establishment but her mind telling her, ‘slow down’. ”I have to go finish chores for the guild. Thankyousomuchfortreatingme.” Sofia left without another word, her head hung down in seeming sadness, yet her eyes glared at him from the safety of anonymity. Sofia nodded, but her sour expression sweetened to honey as soon as she saw him. Her legs trembled trying to resist the urge to just charge him and curl up into his arms. But in this, she dallied. She dallied enough for another to catch up to her should they choose to. She stated something, a harmless sentence that would turn the mood of the whole date sour in contrast of the fun time established moments before. Jinchu had no idea a situation could so simply turn to a fun time to a dine and dash, 'Does she have a problem with magic users?.... What is it?' Before he could ask, like all the other times, she abruptly set the pace of the next few seconds before her quick departure. ”My best friend always tells me I need to eat and grow stronger, but he always leaves when I start…” Sofi's voice was so low he could barely get it all without straining his ears to maximum focus. He also thought it was weird, 'Why would you call someone your best friend if they didn't even like to eat with you?' Jin obviously was out of the loop but he would not attempt to get his own words in quite yet. He could feel in his gut that she would have at least one more thing to say before giving him his turn. Sofi seemed to be fidgety by nature but even her extremes got more intense as the moment got slightly uncomfortable. Jinchu took a bite of his food rather slowly as he actually did try and think of something to say, statement or question he wasn't sure, she was really a hard person to read by an observer's standards, let alone Jin's abilities. ”I have to go finish chores for the guild. Thankyousomuchfortreatingme.” She made to dash without saying another thing. Jin's first instinct was to get up and stop her but he just waited to get the jewel he needed out and placed it on the table, yelling over to the guy at the counter. "This should cover it!" Not waiting any longer he swiftly went around the table and made to catch up to his new friend gone rogue. She didn't make it anywhere far, almost look like she was waiting for someone just outside the building. "Sofi?... What are you doing?" Of course Jin didn't get it. But not only that he thought the day was going great so why let it stop now? This girl was one of the most intriguing people he had ever met. Her cheeks flushed a bright, pink hue as if she had seen someone she hadn’t seen in so long. But…”It hasn’t even crossed a hour mark little Sofia,” Pikels proudly stated as a matter of fact, his chin peering down towards her while his eyes unenthusiastically darted between Sofia and the boy rushing after her from behind. Without even waiting for Sofia’s response, as if he knew the answer, he turned his back and went about his business away from Sofia’s sight. She, in turn, rapidly rotated with her eyes sparkling with a renewed sense of happiness, yelping out as an excited puppy would at the first sound on the doorstep, ”Yeah!” Grabbing onto his wrist with no sense of propriety, Sofia explained, ”I told you, I have to go buy things for the guild! So, do you wanna come and help me?” Sofia’s eyes still gleamed from before, her chest brimming with confidence, all juxtaposing the seeming weakness in her still unstable knees. Jinchu made his way after his friend and little did he know what he was to be faced with next. Sofi turned on the spot, looking as excited as ever at the site of him, or maybe from something else. Either way she looked quite about happier than she did when she up-and-left him. "Yeah!" The small girl then took hold of his wrist, about to lead him on some sort of adventure, ”I told you, I have to go buy things for the guild! So, do you wanna come and help me?” An extra giddiness flowed from her like her whole body was ready to sparkle. Jin's own smile took form in response, he had no real urgent errands to do today and running around town with a friend didn't seem like a bad idea. "Yelled at?" Jinchu had his smile turn into a more competitive grin, "Well, what if I yell at them back? Hehe, not skin off my back if you want." He was joking, but it still had some truth in it. Jinchu would be fine with getting bit of action in terms of conflict. 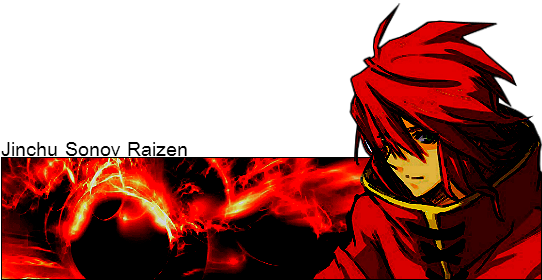 Fighting legal guild mages would prove as good practice, especially if a couple of them were strong. This however probably wasn't Sofia would have in mind so he wouldn't let her know how truthful that offer could have been.